With Mussolini s Italy, R.J.B. Bosworththe foremost scholar on the subject writing in Englishvividly brings to life the period in which Italians participated in one of the twentieth centurys most notorious political experiments. Il Duces Fascists were the original totalitarians, espousing a cult of violence and obedience that inspired many other dictatorships, Hitlers first among them. But as Bosworth reveals, many Italians resisted its ideology, finding ways, ingenious and varied, to keep Fascism from taking hold as deeply as it did in Germany. A sweeping chronicle of struggle in terrible times, this is the definitive account of Italys darkest hour. R. J. B. Bosworth is an Australian historian and author and a recognized expert on Fascist Italy. He taught history at the University of Sydney and the University of Western Australia, and was a senior research fellow at Jesus College, Oxford. 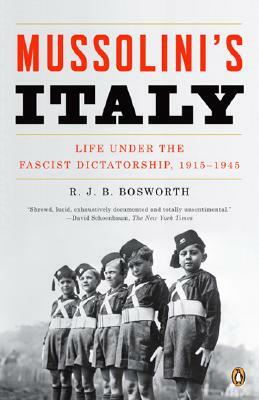 A fellow of the Academy of the Social Sciences in Australia and of the Australian Academy of the Humanities, Bosworth is the author of Mussolini's Italy: Life Under the Fascist Dictatorship, 1915–1945 and The Oxford Handbook of Fascism.